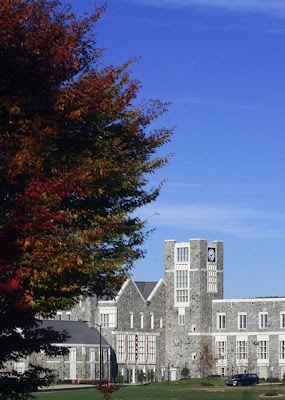 Mike and I took a couple of days away this week and spent some time in Blacksburg. We stayed at the new Inn at Virginia Tech. It was nice being right on the campus. On our ride home we had a conversation about how much things change and how much they stay the same. We didn’t have cell phones, lap tops, or even email during our college days (I know that makes me sounds really old – it’s only been 13 years ago 🙂 But in so many ways things were very much the same. The campus has lots of new buildings but in many ways it look exactly the same. It made me think about how many students had gone through those building since I had been hurrying to class there. The word speck came to mind. I realized how tiny I seemed in the scope of the history of that campus. But we are all Hokies. I am even more tiny in the scope of God and eternity but I am reminded that He knows every hair on my head and I am not a speck to Him. We are all His children.